Prospective marijuana growers who lack the money to bankroll their own sites increasingly are turning to companies that specialize in leasing land to cannabis cultivators. That has created a mini boom in the emerging real estate leasing business – and given cultivators a new avenue for launching their companies. 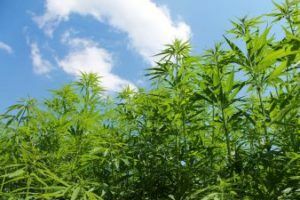 Executives with real estate firms that lease to marijuana growers say the market for their services is large and growing, fueled by increased demand for cannabis and the need for land to grow the plant. Investors, meanwhile, are pouring millions of dollars into these businesses. Looking ahead, the expected growth of these companies is expected to transform cannabis cultivation, with mega grow sites becoming more the norm, some experts said. The land leasing business has certain attractions, apart from being a part of the overall growing marijuana industry. Leasing company executives don’t actually touch the plant – so they don’t carry any personal risk – and there is relatively limited competition because of the specialized skill set and the large amount of money needed to bankroll such an operation. “In this industry, there’s plenty of room for people who have the skills that we bring to the table, and an opportunity for everybody to be successful because the growth within the industry is quite high,” said George Stone, CEO of Kalyx Development, a Manhattan real estate company that leases property to indoor cannabis growers and operates properties in Colorado, Washington and Oregon. The companies that have started in this business are attracting the attention – and checkbooks – of small and not-so-small investors. FutureLand Corp., a Denver-based cannabis cultivation leasing company, made waves recently when the Kodiak Group, a mainstream private equity firm, bought $1 million of its stock. Publicly traded Kalyx, a real estate investment trust, or REIT, raised $25 million last November and announced in May it was out to raise a Series B round of between $25 million-$35 million. And AmeriCann made headlines in April when it invested $4.15 million in a nearly 1-million-square-foot cultivation and processing facility in Freetown, Massachusetts. Later that month, it converted itself into a REIT. These companies provide investors certain advantages, including comparatively high yields, relatively straightforward tax rules, and liquidity because their shares are bought and sold on a stock exchange. The exploding need for grow property is expected to drive what cultivation facilities look like in the near future. Smaller facilities, as in 10,000 or 20,000 square feet, will be supplanted by gigantic sites with hundreds of thousands – even millions – of square feet of space, some experts predicted. The “path forward” will look more like today’s commercial agricultural produce cultivation operations, Keogh said. “Look at produce, grown in master-planned greenhouses with built-in efficiencies. Those efficiencies haven’t been brought to the cannabis industry. We are bringing them in,” AmeriCann’s Keogh said. The numbers are alluring, and renting property to money-making cannabis cultivators seems like a simple enough business model to manage, given that business owners aren’t technically touching the plant. Because few companies currently are in this emerging real estate business, there’s plenty of room for competition. And those companies that are getting into it account for only a miniscule amount of cannabis-related property in this country, observers said. “In all forms of real estate, there are hundreds of competitors, and there seems to be enough business to go around,” Kalyx’s Stone said. So why aren’t more players jumping into this business sector? It’s tough to launch such a business. Renting commercial-scale grow space requires significant investment capital and a specialized skillset that few people possess. Companies don’t simply buy land, lease it and leave tenants to fend themselves. Rather, they invest significant capital – Stone said the low seven figures – to outfit a site for cultivation, including climate control equipment, power, drainage, and even testing equipment. Moreover, not everyone thinks leasing is the best way to go. “There are some potential quagmires there,” said Cameron Cox, CEO of FutureLand, which owns two cultivation properties in Colorado. By quagmires, he meant local political foot-dragging that can make it hard to get all the permits required to start such a grow site. I seriously doubt that Kodiak actually bought $1mm of stock in Futureland. Kodiak deals to invest with Indoor Harvest and MyDx have evaporated recently. I’m only asking, were? And how much? I have 15 acres in Eastern Washington, to lease. If they executed it could have been on a part of the $1M PIPE which would explain the lesser volume and recent slide? Based upon the activity I would tend to agree with Alan. what cap rate are associate with these types of property sales? And as more investors compete for these deals should we expect the rate to decline? I should also point out that AmeriCann didn’t invest – it has agreed to invest (with money it still needs to raise). This is just another shinning example of how for-profit corporations think they can “profiteer” from unlawful business activities. How to make money from aiding and abetting illegal business operations does not protect capitalist simply because they’re not actually growing marijuana themselves! Until Uncle Sam removes marijuana from the CSA no one should be “profiting” from such plain and simple! Skirting around the truth and the facts won’t protect anyone and greedy investors know this which is why the come up with these schemes and the appearance that they’re helping the process because they have deep pockets and seek profits! At least they pay their taxes. Everyone growing is doing it “for profit”. Like I have said in prior posts the Industry is going to be dominated by big money so what are large growers now will be small growers in scale later. The costs will go down which is good. But the small ones will have their margins squeezed. Story of Commerce everywhere. The Big Pig shoves the small Pig away from the trough. Hmm… Should have been that way after Prohibition, but when the big boys rebuilt their mega breweries there was still plenty left over for small and medium companies providing better quality and even regional pride. I can imagine a larger proportion of mega grow harvests to go into edibles as compared to the “Craft” growers that are more likely to offer higher quality, fresher product and wider varieties of flower that will capture enough micro and regional success to challenge mega grow operations. Sure, mega growers are expected to have an impact, but I can’t imagine the market will allow them to prosper exclusively. Big Business always has onerous regulations passed so that smaller ones can’t compete so that remains to be seen. Big business is the largest pac of quick money get rich schemes without knowledge, with that said in experience, “quality by all means” must stay in the individuals that strive and love the best, naturally anyone can profit with the big green boom, “but” when the profit is exceedingly large, all morals are swept aside, it’s astonishing how I was tortured with brain cancer, White Lemon cannabis intercepted the cells and reemission is my results. Pharmaceutical companies, oil companies, they have always been there, early 1900s in the cannabis fall, black marketing strategy and flags and banners for decade’s, it’s all been planned out for all them years, I’m just a little pawn myself “but” me and my wife grow the best, were retired and hardly know how were going to make it. Don’t know if you were expecting a comment like that, just was going over these threads, yours stood out. Land leasing also carries risk when a lot of land is contaminated with heavy metals etc. The land owners will be sued as well as the cultivators. There’s also a RICO rick from EPA. We are trying to figure out the process to lease a portion of our land for a grower. We have water rights so it comes with irrigation. We are located in Pleasant Hill, Oregon and we are looking to lease 5 acres. I have 17.2 acre property located in Montesano, WA, old dairy farm and am interested in selling. Property is zoned commercial and residential with it’s own well and is adjacent to the Satsop River,very fertile land. Want to reach out to someone who better understands how to market said property.. I own land in Osage County Oklahoma..it’s restricted indian land so federally protected I am looking to lease it for growing operations as long as it’s legal and on the up and up.. I have 140 acres in East Txas for lease if interested. I want to know how cannabis growers pay per square feet for leaseing land. I have 50 acres in sunny vly,Or which part of already yearly has been grown on looking 2 even sell home and all 2 rt person. Very flexible. Cannabis real estate is certainly the biggest sector in the industry competing with the online dispensaries for first place. Real estate & it’s related services will be big and profitable. I have a 5 acre certified organic farm that I am interested in selling at this time. I will be retiring. Any interest? Amy Rogers are you a Cannabis Real Estate professional? 8 acres in Oklahoma for lease. I also have land to lease. It is located in the Trnity Pines area of Trinity County Calif in the Emerald Triangle. It’s only just over 2 acres but is south facing and just off Hwy 36. It’s also completely undeveloped so someone with resources and ability for landscaping etc would probably be best suited. Anyhow, if this sounds good for the upcoming season feel free to contact me.